Can be individually configured for different body types. UPLIFTING Solutions has released a new range of Obus 10 ergonomic operator chairs to help bad backs. It features a patented back rest to provide support to all areas of the back and an ergonomically designed seat pan to facilitate easy sitting at any height. Each Obus also has an adjustable neck cushion for extra support and is five way adjustable to allow optimal orientation of the worker to the task. 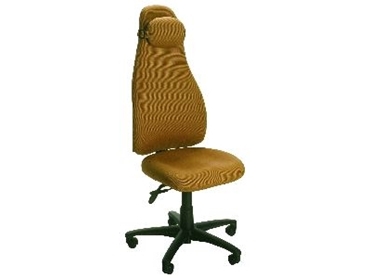 The chairs can be individually configured for a variety of different body types and are particularly suitable for staff with pre-existing back or neck injuries. Manufactured in Australia, the Obus 10 features a ten year warranty. The Obus 10 will be exhibited at the Sydney Safety Show in October 2005.